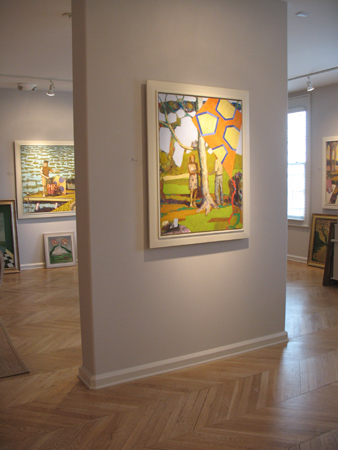 Last weekend closed Jim Byrne’s show at Tew Galleries. Jim had found my blog and invited me to his opening. 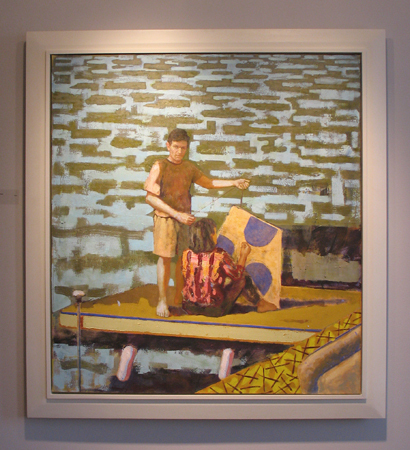 A group of his newest paintings was exhibited there from October 25 to November 25th, along with artist Isabelle Melchior. I was unable to make the opening, but saw the show and took some photos. Lighting is always an issue with photographing paintings in a gallery, there is some glare and color discrepancies in my shots. The best solution is to view the work on Jim’s site. 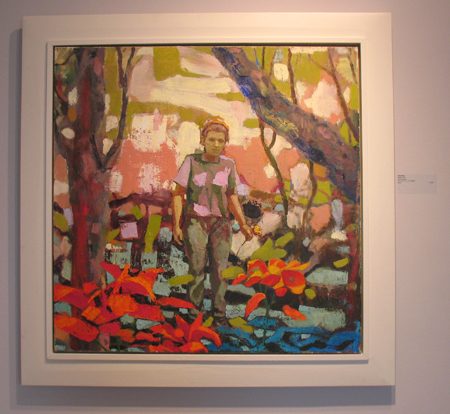 Byrne’s brushwork is luxurious and his palette both subtle and bold, revealing a sophisticated colorist. His people look more fully developed and ‘alive’, than if he’d relied solely on photographs, and like Balthus, he captures emotion and mood in the dynamics between the figures, the viewer and the landscape. 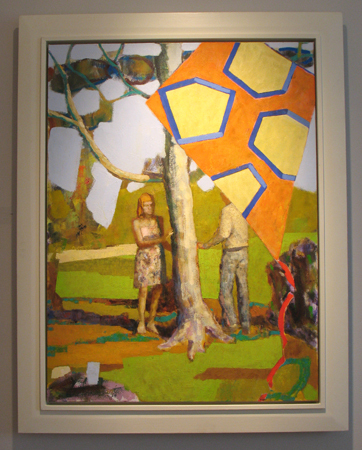 The patterns that he weaves into objects and backgrounds recall Matisse and Vuillard. The guy can paint. 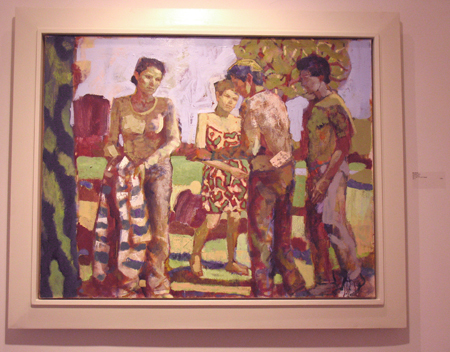 In this group of paintings Byrne continues with his familiar imagery of figures engaged in uncertain activities situated in imagined park-like settings to explore the psychological conditions embedded in human relationships, exploring new themes such as aging, reflections on the past and journeys forward. Byrne, however, has pushed into a greater degree of abstraction, expanded color interactions for emotional effect and created more spatial ambiguity. He is inspired by Persian manuscript illuminations, Chinese landscape painting, Early Italian Renaissance painting and the Early Moderns. 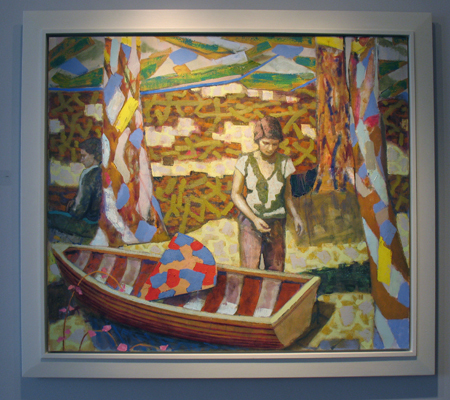 In this body of work Byrne has moved into the metaphysical, symbolic and emotional realm, creating a poetic dream space. 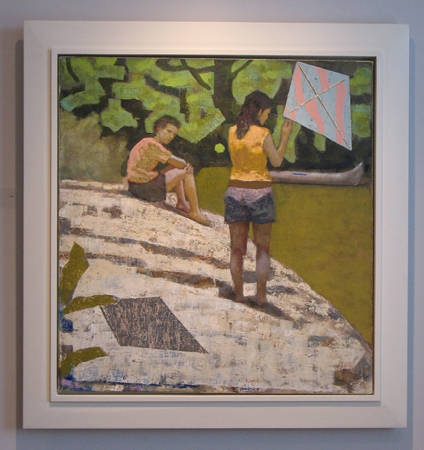 Recurring throughout many of his paintings are images of kites and boats along with objects of childhood, play, fantasy and escape. Figures relating or not relating to each other along with these objects are caught in their own interiority, serving as a means of reflection for the viewer, asking questions without giving answers. I had wanted to do an interview with Jim after seeing his work, to explore his influences and background and to further investigate the psychological mysteries in his work. He graciously complied. VW – What led you to become a painter? JB Like many others, as a kid I always liked to draw. I also have two older brothers that are very creative and they made a lot of things that were around the house when I was younger, from hand-made action figures to a model replica of an old general store. These things really captured my imagination and inspired me to want to make things myself. Growing up in the suburbs of Chicago, with a father who was an engineer, I didn’t have much other exposure to the arts in my house. At some point I became fascinated with painting and would spend many hours after school in my bedroom making these moody barn-realist landscapes. Then, when I was in high school, my class took a field trip to the Art Institute in Chicago where there was a major Edward Hopper exhibition on view. It impacted me profoundly. Hopper’s light and austere depiction of space cut to the emotional bone. This fueled my desire to paint. When I went to college in Champaign -Urbana I began as an art major, honestly, thinking that I would switch into something else. But the more people I met who were artists, or had alternative lives, the more my mind opened up and my world view began to change. Getting a good job seemed less important than taking a risk and following a path that led towards something I cared deeply about. I stayed very focused on painting the entire time yet remained very uncertain about the future, conscious that at any moment I may have to drop it and get a real job. 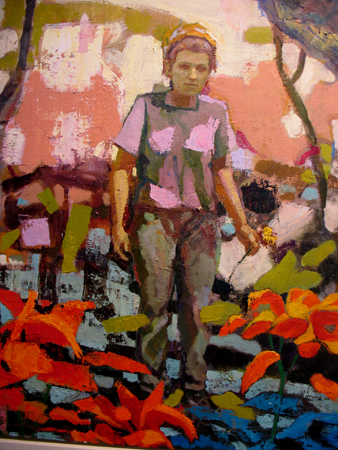 Incrementally, with a lot of support from teachers, monetary support from schools and art institutions, and emotional support from family (being the youngest of nine kids, given the maturity of their age, my siblings and parents always encouraged my freedom to be what I wanted to be and to place emotional well being over any monetary interests) I became a painter. VW – You went to school in Chicago and at UNC, Chapel Hill. Now you’re teaching at a college on Long Island. Do you find being near NYC an advantage? JB Art comes from art. Having access to the greatest collections in the world in the NYC museums and continuous exposure to so much contemporary art through the galleries has been critical to my development. The frequency of contact with great works deepens my understanding of the history of art and the casual contact to new ideas in the galleries creates moments for creative connections and discovery. Last week, to give just a few examples, I saw Stanley Lewis’s drawings at the National Academy shortly after seeing Leon Kossoff’s drawings at Mitchell-Innes & Nash. What a fantastic dialogue those two artist’s works had in my mind. That same day I saw an exhibition at Gagosian gallery of the Poloroids Balthus used for reference in his late work after having seen the beautiful show of his work at the Met the week before. Within an hour I was back in front of those Balthus paintings with a new understanding of his process, intentions and his sensibility. You can’t have these kind of experiences unless you are physically there and as great as the internet is, it is no substitute. VW – On a similar note, I’m curious about whether you’ve found galleries in NYC receptive to your work. Abstract art seems to currently be a very strong trend, but galleries like the Forum prefer figurative works and I noticed that you showed there in the mid nineties. JB I was fortunate to show with Forum in the nineties and appreciate Bob Fishko’s support of my work in the past. At the time, the art world seemed very segregated between different art factions with little cross-over between those associated with figurative/realist galleries and others. Things may have loosened up a little, ironically, because of the explosion in abstract painting and the revived interest in the pleasure of painting and belief in the many possibilities of painting. This, along with the expansion of the gallery scene and greater exchanges and exposure through the painting blogosphere, may have allowed for more cross pollination and fewer divisions between artistic approaches and the venues where they are seen. Then again, maybe I am just being idealistic. It’s not hard to make an argument the other way. JB I’m very disciplined with my studio routine. It is important to me to go in everyday, and even when I have no ideas, I hope something will come from the time spent getting my hands dirty. 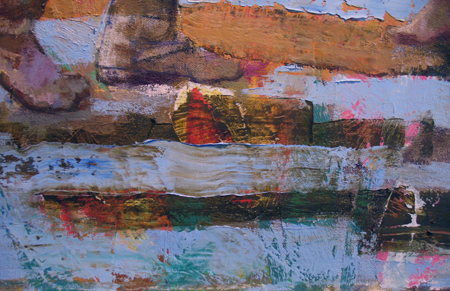 I work from a lot of different source material – life drawings, photos, plein air landscapes and abstract color studies. I’ve drawn from the model since college but a few years ago I made it more of a focus of my practice where I have hired people to come sit for me in the studio. I have hundreds of life drawings that I use when making paintings. I’ve also been doing a lot of drawing in my sketchbook where I draw things from my imagination with an effort to encourage free associations. Any of those sources can serve as the starting point for a painting. At the start of a painting I am often thinking of a kind of gesture or relationship between people or between a person and an object or a space that resonates with some symbolism that seems relevant to ideas I have at the time. As the painting develops I’m open to many possibilities and will freely make changes. At some point the painting will take form and begin to have its own internal logic. From there I try to let that be the guide while making use of intuition as much as possible. 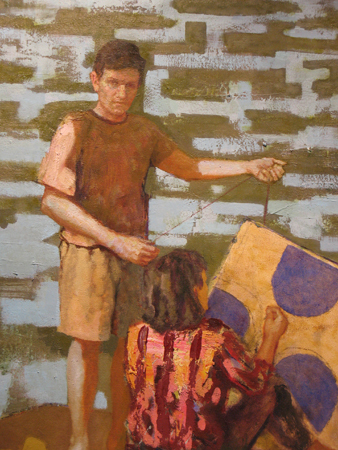 The source material will again aid in the later stages of painting to make the image more concrete. VW – Your artist statement on your site mentions a raft of influences, including the Early Moderns. I’m not sure I know what period that term encompasses, except that I can see a hint of Baselitz and Eric Fischl. My immediate reaction to your work recalls Vuillard’s patternings and palette, with a little Morandi thrown in. There is also the formalism of the early Renaissance landscape as a backdrop that contrasts nicely with your characters’ mysterious, almost mystical personae. Can you talk about the context of the paintings and any ideologies you may have as an artist? And are there current painters whose work excites you? JB Vuillard was an important early influence, as was Bonnard and the other members of the Nabis. The Post-Impressionist, especially Cezanne, and then into Matisse and the Fauves, early Mondrian, Expressionists like Max Beckman, you name it, all those painters that bridge the end of the 19th into the beginning of the 20th century excite me. That was a time when painting was just exploding and all these artist were challenging ideas of perception and expectation. Eric Fischl was important to me in college, especially his way of speaking through an ambiguous narrative, not to mention the content of his work at the time was placed in a familiar world, similar to the one I had experienced in the suburbs. He also was someone who painted the figure and was embraced by the larger art establishment. So in that way, he was a model for what was possible. In general, I am drawn to a kind of psychological condition in which a paradox is presented. The figures in my paintings have a kind of heaviness of being at the same time the space dematerializes into pattern. There is a kind of particularness to the representation of the figure while there is a Classical feeling of eternal order to the setting in my paintings. In certain historical art, the inwardness of gesture that is paired with a formal beauty and strength of pattern and color is exceptionally moving to me. This can be found in paintings from the 15th century, especially Fra Angelico and Sassetta. As far as how this fits into a contemporary context of the history of art, I’m not sure, but I think I have stopped worrying about it. When it comes to contemporary art, the artist that excite me the most are mostly abstract painters, among them I would include Bill Jenson, Thomas Nozkowski and Brice Marden. 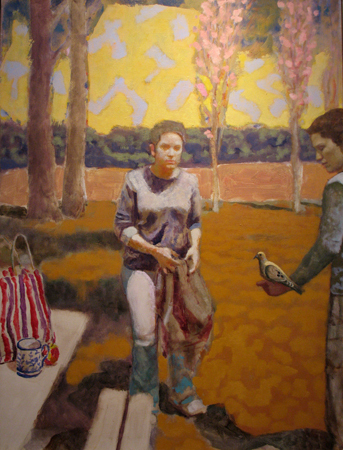 Some figurative painters that interest me include Dana Schutz, Sangram Majumdar and Amy Sillman. I’m looking forward to seeing Sillman’s show in Boston soon. When it comes to those that deal with imagery, I am often more interested in photography. I just saw Thomas Demand’s current show. The way models function in art to explore fantasy and truth fascinates me. VW – You have been teaching art for over twenty years. Does this allow you more time for painting or did you need a sabbatical to create, say, this newest body of work? JB It is what it is. I have found a balance in my life so I can do both. This new body of paintings, although they were all completed this year, really represents 6 years of work. I work in the mornings a few hours before I teach and during the summer I am in the studio full-time. I used to live in the city and commute out to teach but several years ago my wife and I made the decision to move to be nearer to the school so I could have more family and studio time. VW -There is a group of work from 2012 on your website that is nothing like your figurative paintings. Completely abstract, they seem to investigate color, dynamics and motion. Could you speak to these and what your intent was in breaking away from figuration? JB About four years ago, after feeling a little lost with my work, I began painting completely non-objective works. I had been thinking about it for a while, and as I said, most of the contemporary paintings that interested me were abstract, so I decided to try it just to see what it would feel like. In my work, although it had been narrative, I had become more and more interested in exploring the language of painting than in telling a story. It is through color, space, light, balance and harmony that I was most interested in conveying an emotional condition. It was extremely liberating and stimulating and it gave the jolt my figurative work needed. VW – Some artists suggest that the studio is too private for them, that they require a social forum for their work. Does networking with other artists and developing community have much bearing on your life as an artist and if so, how does it inform your work and process? JB I thrive on the solitude I get in the studio. However, the access to the work and ideas of other artists, and their critical response, is essential. It’s difficult though because there is only so much time to be divided up and for me the time in the studio is the most important. I think blogs like yours, the Painter’s Table and others are extremely helpful. It does a lot to stimulating thought and you can come to it when you are in the right place mentally and at a convenient time so it doesn’t conflict with the studio. However, at times I do feel isolated where I live and it is important to connect to people and share ideas and get feedback. It is an essential part of the creative process. VW – I’m always curious about how painters are utilizing social networking. I know artists who have been successful marketing their work online, even while they’re represented by a gallery. You obviously have a website, but have you explored some of these or other alternative ways to either exhibit or sell your paintings or prints of your work? JB I am only really just beginning to try to use social networking and have any online presence. I feel like I’ve been working in a cave for the past ten years. I’ve just come out of the dark and my eyes are trying to adjust to the light. VW – Any immediate plans for exhibits and/or the next series? JB None right now. I’ll go into the studio tomorrow and we’ll see what happens. 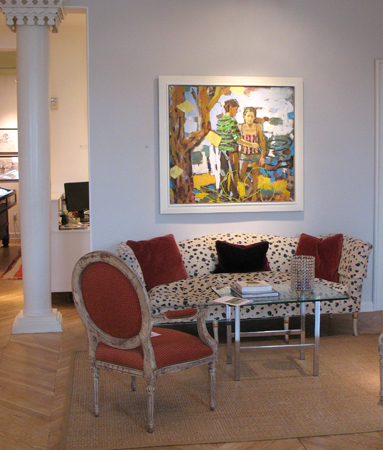 You can view Jim’s work on his site, and at the Timothy Tews Gallery. 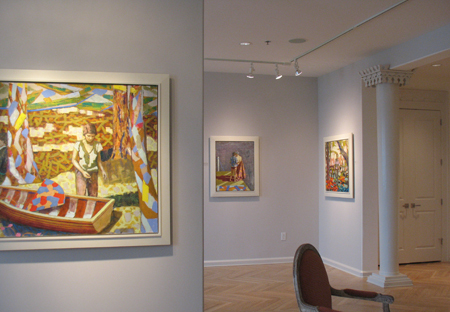 Local critic Jerry Cullum’s review can be found at ArtsATL here. 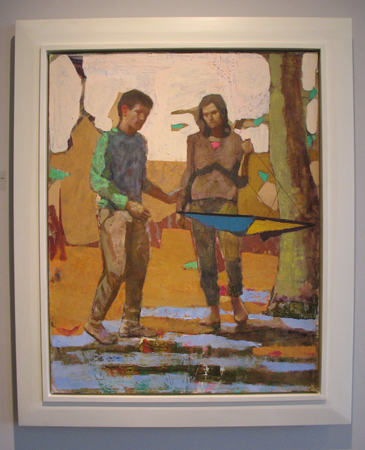 This entry was posted in Art reviews, criticism and blogs and tagged Atlanta, balthus, chicago, figurative art, Forum gallery, fra angelico, jim byrne, Matisse, painting, renaissance, timothy tew gallery, vuillard. Bookmark the permalink. Thanks and thanks particularly for the interview.